Originally created in 1990, Veal Quality Assurance (VQA) is a program of science-based best practices developed by farmers, industry leaders and animal care experts to ensure that veal calves receive quality care through every stage of life and are raised using production standards that result in a safe, wholesome, quality product that meets or exceeds regulatory standards and customer expectations. Specifically, VQA is designed to address all aspects of animal care and on-farm practices that will enhance veal calf quality. Education is a key component of the program regarding animal handling, health and nutrition best practices. A veterinarian-client-patient-relationship is required to meet the VQA certification requirements. Individuals involved in raising veal must be recertified every three years. 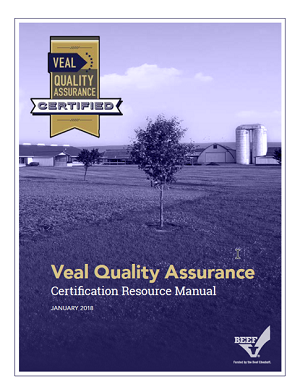 VQA resources are available at http://www.vealfarm.com/certification-resources/ A technical review and update of the program was conducted in 2017.